Florida’s population is 20% Hispanic, the 6th highest Hispanic population share nationally. New Mexico ranks first with 45%. Almost 14% of eligible voters in Florida are Latino, the 5th largest Hispanic eligible voter population share nationally. New Mexico ranks first with 38%. More than 46% of Latinos in Florida are eligible to vote, ranking 18th nationwide in the share of the Hispanic population that is eligible to vote. Florida’s Hispanic eligible voters are younger than all eligible voters in Florida—23% of Hispanic eligible voters in Florida are ages 18 to 29 versus 19% of all Florida eligible voters. Latino eligible voters in Florida are much more likely to be naturalized citizens than are all Florida eligible voters—45% versus 12%. They are also more likely to be naturalized than are all Latino eligible voters nationwide (26%). The proportion of Hispanic eligible voters in Florida who have attended college or earned at least a bachelor’s degree is nearly equal to the proportion of all Florida eligible voters who have that level of education—50% of Hispanics versus 54% of all eligible voters in Florida. Hispanic eligible voters in Florida also have a higher level of education than all Hispanic eligible voters nationwide, only 41% of whom have attended college or earned a bachelor’s degree or more. Latino eligible voters and all eligible voters in Florida have similar household incomes. Almost 48% of Latino eligible voters reside in households with incomes below $50,000 while 45% of all eligible voters report the same. There are almost equal numbers of black and Latino eligible voters in Florida—1.6 million blacks compared with 1.7 million Latino eligible voters. Black eligible voters are younger than Hispanic or white eligible voters in Florida—28% of black eligible voters are ages 18 to 29 compared with 23% of Hispanic and 16% of white eligible voters. 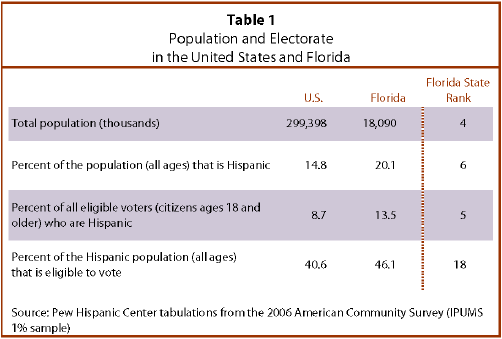 Hispanic eligible voters in Florida are more likely than blacks, but less likely than whites, to have attended college or earned at least a bachelor’s degree—50% of Hispanic eligible voters have attended college or earned at least a bachelor’s degree compared with 57% of white and 41% of black eligible voters. Hispanic eligible voters are less likely than white eligible voters in Florida to live in owner-occupied homes—69% versus 78%. Latino and white eligible voters in Florida have similar household incomes, but black eligible voters report lower levels of household income—48% of Latino, 42% of white, and 58% of black eligible voters report household incomes less than $50,000.